Construction is due to commence on a skyscraper by Foster + Partners in Mexico City, set to match the height of the city's tallest tower. Mexican developers Abilia revealed in a statement earlier this month that it will begin work on the British firm's Reforma 432. Mexico Daily News reported that Aramburuzabala said the tower will include 57 storeys – three more than a design description released by Foster + Partners in 2014. The announcement – made by the company's billionaire owner María Asunción Aramburuzabala – comes after a seven-year-long period of interruptions on the development, formerly called Sky Tower and overseen by real-estate developer Grupo Elipse. With the extra levels, the tower will match Mexico City's tallest skyscraper, Torre Reforma, completed by local firm LBR&A Arquitectos in 2015. Both towers are named after their location along Paseo de la Reforma, a wide avenue that runs diagonally through the city. Reforma 432 will occupy one of the remaining plots on the street, at the junction between Paseo de La Reforma and Avenida Sevilla, facing the city's monumental Huntress Diana fountain. To make the most of this setting, the ground level of the tower will form an open public space connecting to the street, with shops, cafes and restaurants housed in the four storeys above. Early renderings show these as terraces, elevated above ground and protruding out from the central core of the tower. Offices will occupy the rest of the tower, rising above in two volumes that appear to be separated by an outdoor space. Windows will be placed in a vertical arrangement to give a striated pattern to the exterior. The structural core will be placed off-centre to allow for flexible floor plans and open up to views and natural daylight. 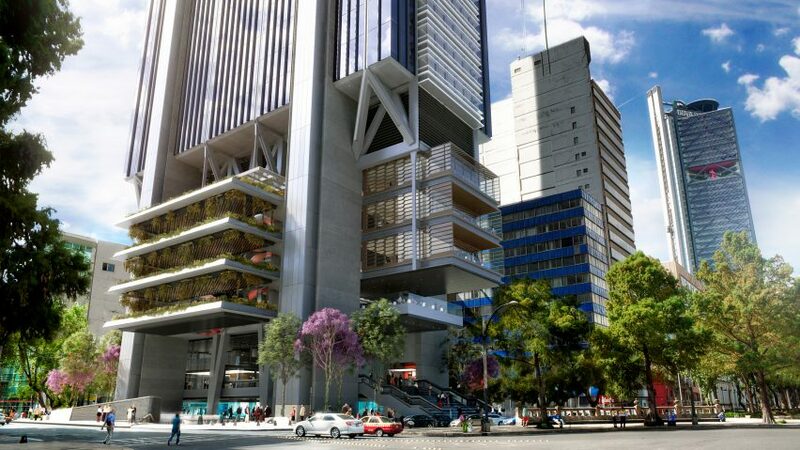 Abilia is yet to announce expected construction and completion dates for Reforma 432. Dezeen contacted Foster + Partners for more details but is yet to receive a response. The firm, headed by British architect Norman Foster, placed ninth on the 2017 Dezeen Hot List, a comprehensive guide to the hot topics and key figures in the architecture and design world. It is also currently working on an airport for Mexico City with Mexican architect Fernando Romero, which is set to be one of the world's largest when completed in 2020. Foster's firm was the first major global architecture studio to commit to change in the light of our Move the Needle initiative, aiming to improve gender equality in the architecture and design industry. Renderings are by 24studio, courtesy of Foster + Partners.